Axium Process’ crossflow membrane filtration systems can now also remove microplastic pollution in wastewater streams. Axium Process’ crossflow membrane filtration systems, designed to remove bacteria, pesticides, suspended solids and colour from wastewater, can now also remove microplastic pollution found in most wastewater streams. The removal of microplastics from drinking, process or wastewater streams is a major step towards the reduction of microplastic pollution found in the environment. Although the use of plastic microbeads in cosmetics and personal care products has already been banned in many countries, microplastic pollution is still being generated by the waste plastics already in the environment which are ageing and self-abrading on a very wide scale. As a result, most water sources now contain background but rising levels of microplastic contamination, which can ultimately feed back into in the human food chain. 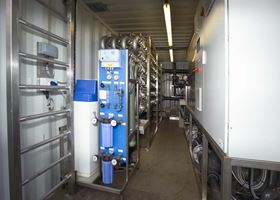 Crossflow membrane technology works as a physical barrier against microplastics where the particulates cannot pass through the membrane on the basis of particle size, allowing only crystal clear commercially sterile, particle free water to be discharged. All the microplastic particulates and other separated impurities are safely retained in a low volume controllable form ready for further treatment. Ransom Naturals chooses Axium Process to design and build a mobile ATEX Zone One rated membrane filtration system. The fully automated CIP skids by Axium Process come with control panel, PLC and software.